System Requirements: 486/66 or better; 8 MB RAM; 40MB hard disk space; Sound board; Speaker system; 256-color VGA display; 1MB RAM Local video bus; CD-ROM drive (double speed or better). 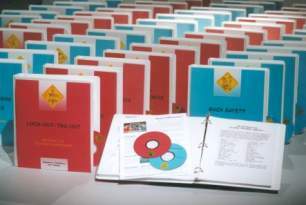 Description: 'MARCOM's "Right-To-Know for Auto Service Facilities" Interactive CD-ROM Training Course introduces employees to the "Right-To-Know" regulations and provides training on all groups of chemicals found in the auto service environment. Using a powerful combination of audio, full-motion video, text and colorful graphics, this Course from The Interactive CD-ROM Training Library provides the most cost-effective Safety and Regulatory Compliance training available today. The Course features platform software which installs automatically, and comprehensive User's and Trainer's Guide. The Course is divided into a number of logical sections so information is easily understood... and retained. Also designed with the Training Manager in mind, all Courses in The Interactive CD-ROM Training Library include a Training Management System (at no additional cost). Using this System, trainers can set up "Pre" and "Post" tests... establish log-in procedures... even define and set up curriculum for various job classes. The System also allows employee performance information to be collected and organized through a powerful relational database, which can generate a number of record-keeping and tracking reports... and has a database "import/export" feature, which allows information to be transferred to and from an external database (such as a company's Personnel Database and/or Learning Management System). The Course is one of over 100 titles currently available in The Interactive CD-ROM Training Library™. Other Interactive Courses on Safety and Regulatory Compliance topics are currently being developed, including Spanish-language Courses, and will be available soon.